by entering your Rewards Card Pin # (on back of card). Earn rewards dollars toward future auto repairs! 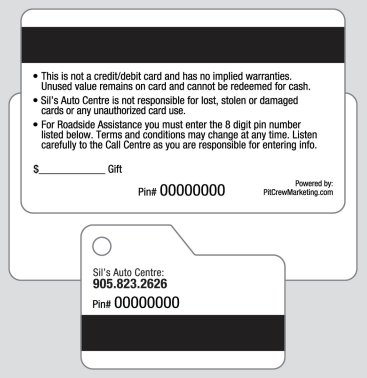 If you have a Sils Auto card, enter your PIN# found on the back of the card in the box above. If you don't, no worries. Just make a service appointment and you'll receive one as a new customer. If you're already a customer and have lost your card then call (905) 823-2626 and we'll make arrangement to issue you a new card to pick up. You can earn valuable rewards dollars towards future automotive repairs and services. You can also pre purchase a card an use it as a gift for other family members. Would you like to earn $50.00 on you Rewards Card and be a hero to another? Referrals are the reason why Sils Complete Auto Care Centre has been in business for over 40 years now. Once you have your rewards card we would like to say Thank you when you refer your 1st person to us by applying $50.00 onto your rewards card. Please enter your information on this page and the contact information of another person. 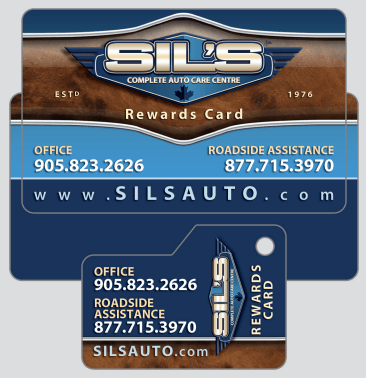 The person you refer to Sils Auto will receive $30.00 off any service* (some restrictions will apply) and once we have completed their visit you will be rewarded $50.00 onto your rewards card for your 1st referral. Click here to refer a friend and get your reward!